There was once a warrior on the verge of conquering the world. He had an army of half a million men that made Europe tremble. This warrior had Rome in his sights and was threatening to go after it. Pillage and destruction followed this man wherever he went and he was ruthless. Then the night before he was to get married he died. Not in a sword fight, not at the end of a spear or arrow. He died from a nosebleed in his sleep. 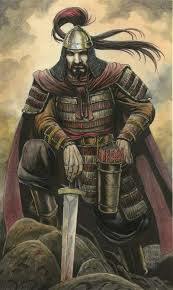 Attila the Hun suffered from chronic nosebleeds. He got drunk, passed out and choked on his blood. One little nose bleed wiped out one of history’s fiercest and bloodiest warriors. This is the time of the year that many people find themselves with new puppies. And raising a new puppy is all about little hinges swinging big doors. What you do with your new puppy will have lifelong effects. Seemingly small, little, trivial events can have a lasting effect and NOW is the time to take steps and get moving in the right direction. The big one for new puppy owners is socialization. The next one is preventing behavior problems BEFORE they start. You also want to start training using positive, reward based methods to teach your pup the basics. Raising and training your pup now will have lifelong implications and what you do now will determine how your dog is as an adult dog. When I explain this to new dog owners some of them become a little nervous and that is when I say…..
…..relax. Chill. It’s all good. There is no need to be nervous because your old pal and good friend, The Amazing Dog Training Man, is always here to help. Question about puppies? No problem. Need help training your puppy? We got it covered. Want to know the best way to housetrain your puppy? We’ll show you how. You see, The Dog Training Inner Circle is the resource to help you train your pup or dog and it is only just $1.00 to join.